2. 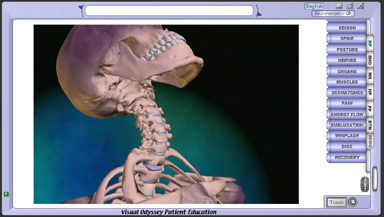 The ability to capture images of a person's posture (with a web cam) and overlay a grid of movable plumb-lines. 3. Extremity joints rendered in rotatable 3D for discussion purposes. The powerful potential of these program add-ons will return your upgrade investment on the first ROF. Deliver an engaging, unforgettable and vivid experience that is instant, dramatic and memorable. * Upgrade to the Silver or Gold at anytime. Turn your Windows PC into a Neuropatholator and reap: realization, retention, referrals and revenue!! Add our Computer / Mouse Hardware Package that turns your TV into a Neuropatholator for only $247 - See Hardware Packages!